Rainbow combo 3 in 1 jump, climb with wet/dry slide Retired unit sold! Fun exciting jump, climb. and (water or day) slide. 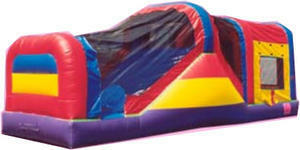 This inflatable is now on sale. It is still fully functional but no longer has the crisp clean look as the units we rent. Original price over $4,200.00. Now offered for sale at aBest offe!. Comes with blower and online training program to operate unit. Will also include operations manual and 'water element' for water slide use.